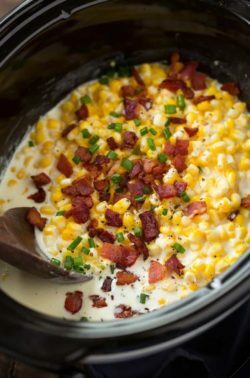 The easiest creamed corn recipe! And for another layer of flavor top it with crispy bacon bits and fresh green onions. This is the perfect comforting side dish and such a breeze to make! Place corn in a 3.5 quart – 6 quart slow cooker. Sprinkle in sugar, salt and pepper. 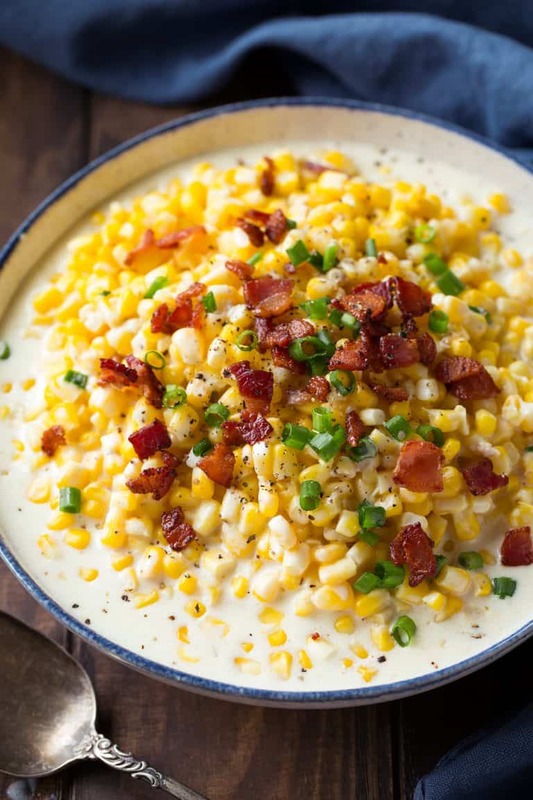 Pour in milk then scatter cream cheese and butter over corn. Cover and cook on high 2 – 2 1/2 hours or low 4 – 5 hours. Stir mixture well (it will seem curdled at first but will blend after stirring. If you want it a little thicker let it rest about 10 minutes with slow cooker turned off). Sprinkle or stir in bacon and green onions. Serve warm.